A nice little break from Christmas cards! I needed a masculine birthday card. I started by sponging (not too carefully!) a strip of Coastal Cabana to the top of the Whisper White card. I then applied, pretty roughly, a layer of Pineapple Punch ink to the rest of the card. Just under the Coastal Cabana strip I then, again very roughly, sponged some Grapefruit Grove and just a touch of Calypso Coral. I tore a piece of paper to create a mask for the mountain (actually it's one I'd made and used for an earlier card and kept in my drawer) and sponged in some Fresh Fig ink - intensifying the shade in some areas and leaving it lighter in others. 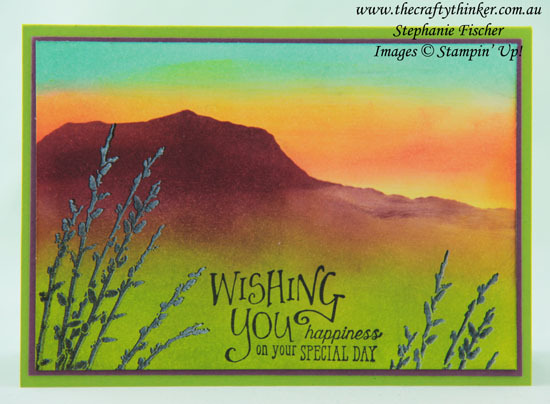 Starting from the bottom of the card, I then sponged on some Lemon Lime Twist and Granny Apple Green inks. I used my Stamparatus to stamp the grass and greeting so that I could control my overstamping. I stamped a few times with black to get a good deep coverage and then, for the grass, moved the paper just a smidge and stamped again with Whisper White Craft ink. To achieve darker grass, I could have reversed that process. The base card is Granny Apple Green with a small layer of Fresh Fig.